Inspired by Chekhov's Platonov comes a dinner part from hell. 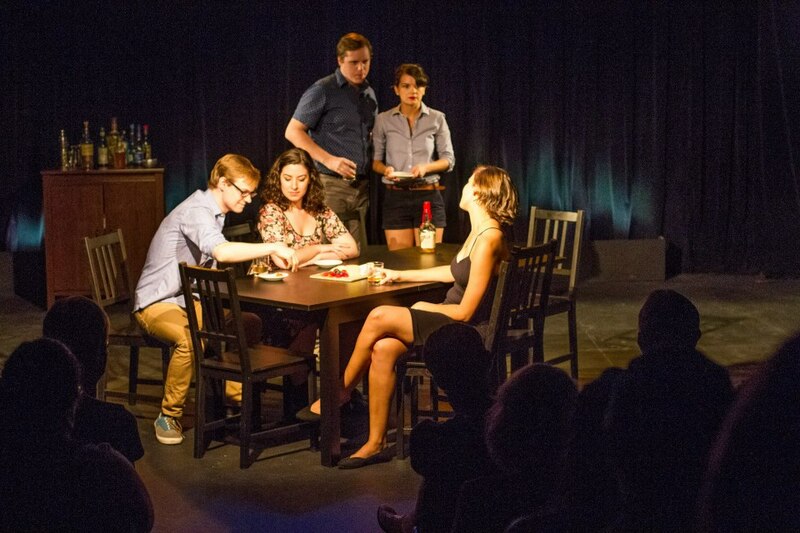 Written by Sean Murphy, The Starter transports the characters and themes from the Chekhov play to Texas where Anna arrives back in town after the drunk driving death of her boyfriend. After sneaking into the home of her former lover the night before, Parker and his new fiancé Jennifer host a dinner party for an unexpectedly growing guest list of friends and strangers. As the booze flows, the truths come out, and a gun is seen and used, well sort of. The Starter is a fast paced comedy that is smart, energetic, and exciting. Murphy’s script does a wonderful job balancing humor with drama and slowing the story to unravel naturally. Unlike some Chekov, Murphy's piece is tolerable. Aside from one drastically long conversation about taxes, everything Murphy serves is important to the plot, explicitly or subtly. The characters that he develops have moments of heightened hilarity but they also happen to be true. They have humility. With strong characters to work with, the spirited and solid ensemble was brilliant. Despite some disbelief, the actors fit their roles well. The star of the ensemble was Haley Jones as host with the most Jennifer. Jones has an unrivaled knack for timing. Jones was rewarded with boisterous laughs due to her character's obsession with perfection and well-placed facial expressions. Not once did she ham it up or milk applause. Tori Hidalgo as firestarter Anna made the most of body language and silence. Hidalgo's ability to send a message with her physicality was dominating. Once she broke out into comedic glory in Act II, Laureb Friednash as bitter and lovesick Sophie shined. The character's irrational mind made Friednash's performance all the better. Playwright Sean Murphy took on the role of resident goofball Trevor. He was fine but was not as strong as some of his costars. Comedy needs to be fast and focused. Director Katie Falter ensured this. By paying attention to tempo, she greatly earned the dramatic moments by keeping the comedy sharp and on point. Without this key element, the piece could have fallen off the deep end. The only struggle Falter appeared to have was due to having a large party sit at a singular table. Falter does all she can with the rectangular table and some dastardly site lines. Eventually a circular table will work in the plays favor but the angle at which Falter placed the table was as good as it could get. Despite a messy party, The Starter is good, clean, fun. Adaptations and inspirations work well when they can stand on their own. The Starter does just that.